We are Manufacture and Wholesaler of Trolley Bag, Duffle Bag, Sling Bag, Messenger Bag, Etc. 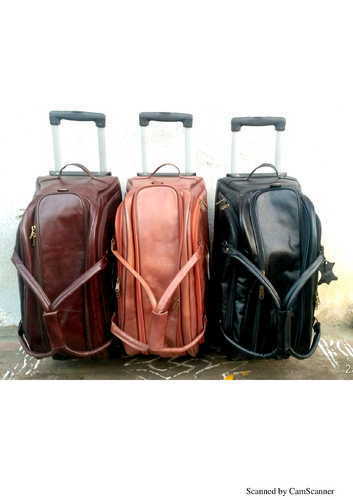 Supported ourselves with proficient amenities, we are readily instrumental in providing an inclusive variety of Trolley Bag. Packaging Details As per norms. Established in the year 2017 at Jaipur (Rajasthan, India), we “Kool Craft Creations” are a Sole Proprietorship firm that is an affluent manufacturer, wholesaler and exporter of a wide array of Leather Bags, Leather Dairies, Leather Belts And Wallets, Leather Cords ,Leather Apron And Purse, Leather Clothing Accessories, Ladies Leather Clutch, Pure Leather Bags, PU And Canvas Ladies Leather Bags and much more. We provide these products as per the latest market trends and deliver these at client's premises within the scheduled time frame. We have also selected a team of devoted and capable professionals who helped us to run the operation in a systematic and planned manner. Under the supervision of “Mr. Sachin Rastogi" (General Manager), we have gained huge success in this field.